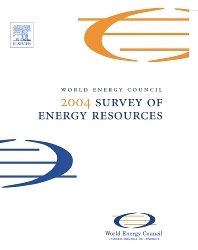 The Survey of Energy Resources (SER) is a unique and authoritative publication produced by the World Energy Council every three years, since 1934. SER presents a comprehensive global picture of resource availability, production and consumption levels, technological developments and outlook for seventeen energy resources, including all major fossil and renewable resources. Each resource is covered in a separate chapter which comprises a commentary by a leading expert in the field, data tables and country notes. The information contained is the best available from a wide variety of sources. The SER is published every three years in line with WEC’s work cycle, culminating in publication at the World Energy Congress. The 20th edition of SER will be published at the time of the 19th World Energy Congress (Sydney, September 2004). Coal; Crude Oil and Natural Gas Liquids; Oil Shale; Natural Bitumen and Heavy Oil; Natural Gas; Uranium and Nuclear Energy; Hydropower; Peat; Wood (including charcoal); Biomass (other than wood); Solar Energy; Geothermal Energy; Wind Energy; Tidal Energy; Wave Energy; Ocean Thermal Energy Conversion; Marine Current Energy.